PoPville » Remember Yesterday When I Said Last Wawa Report for a while? Just Kidding!! Look, I understand Wawa is no Royal Farms but make no mistake, they have many fans for a reason. So, when my sources deep in Hoagie-ville have info to share, share I must. There is no question that a Wawa is coming to Georgetown (and many other neighborhoods), the question is where in Georgetown? 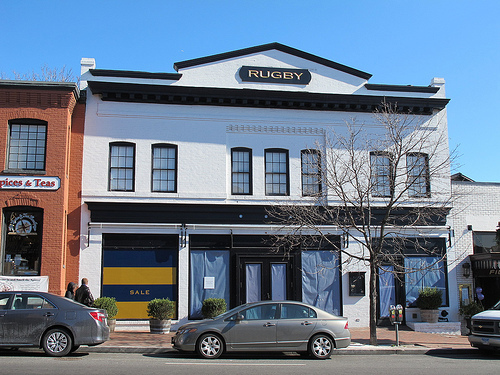 At first I (and others) thought they were taking over the Restoration Hardware space at 1222 Wisconsin Ave, NW. Alas, other sources deep in the world of footwear tell me that, that space is now possibly becoming a Foot Locker. Another independent source in Hoagie-ville tells me that the old Rugby space across from the Paul Bakery (pictured above) will be home to the Wawa. Of course another source says that, that space will become a South Moon Under clothing store. So who the hell knows really? All I can say is STAY TUNED.